Robert W. Lewis. 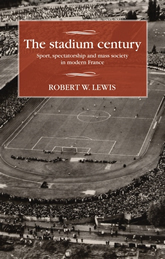 The Stadium Century: Sport, Spectatorship and Mass Society in Modern France. Manchester University Press, 2018. The stadium century traces the history of stadia and mass spectatorship in modern France from the vélodromes of the late nineteenth century to the construction of the Stade de France before the 1998 soccer World Cup. As the book demonstrates, the stadium was at the center of debates over public health and urban development and proved to be a key space for mobilizing the urban crowd for political rallies and spectator sporting events alike. After 1945, the transformed French stadium constituted part of the process of postwar modernization but also was increasingly connected to global transformations to the spaces and practices of sport. Drawing from a wide range of sources,the stadium century links the histories of French urbanism, mass politics and sport through the stadium in an innovative work that will appeal to historians, students of French history and the history of sport, and general readers alike.